Suttur, February 1, 2019: The Adijagadguru Sri Shivarathreeshwara Shivayogi Mahaswamiji Jatra Mahotsav will be held in Suttur Srikshetra from February 1 to 6, 2019, in the divine presence of His Holiness Paramapujya Jagadguru Sri Shivarathri Deshikendra Mahaswamiji. 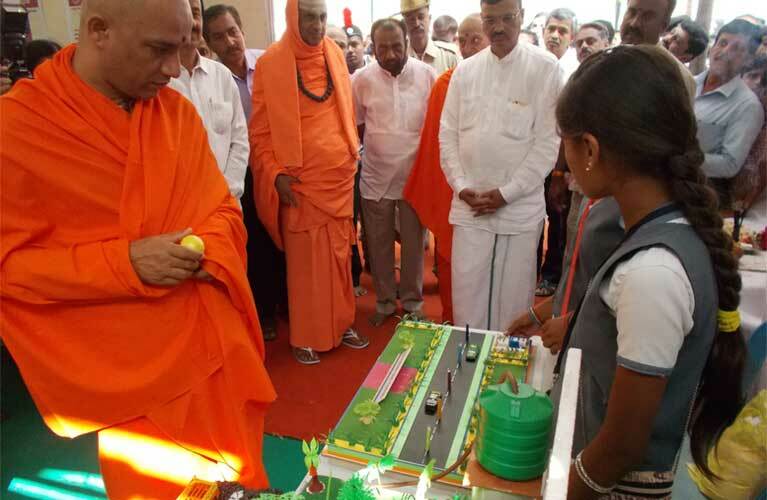 The JSS General Education Department has organized an Educational and Science Exhibition as part of the Jatra Mahotsav, which was inaugurated by Paramapujya Nirmalananda Mahaswamiji of the Adichunchanagiri Srikshetra and Sri Vishwanathaswamiji of the Adichuchanagiri Shakamath, Mysuru, Chunchanahalli Swamiji and Chikkatuppuru Sri, in the divine presence of Paramapujya Jagadguru Sri Shivarathri Deshikendra Mahaswamiji on February 1, 2019, at 10.00 am. Sri Vasu, former MLA, Sri Siddesh, Secretary, Taralabalu Vidya Samsthe, Sirigere, P. Sneha, Additional DySP, Mysuru Division were present on the occasion. Sri Chidre Shanakaraiahswamy, Director, JSS General Education Division, Sri H.V. Sheshagirirao, Deputy Director, management team and others visited all the stalls and gave their appreciation. A total number of 152 models have been exhibited, with participation of 75 teachers and 308 students. The exhibition also include live demonstration by Agastya Foundation, Karnataka State Science and Technology Motivational Society. Models which were exhibited by the Mobile Laboratory of the Science Development Committee in the schools under Mysore University is also included in this exhibition. Pontiffs of various maths, political leaders, public and students have started visiting the Jatra Mahotsav in huge numbers.